This article will highlight some of the common problems with the IWBs used at Danebank and some suggested soloutions. 2 Touch – the ‘2 touch’ boards are the ones with no lights on them, and don’t need a stylus to use. Often with large grey speakers either side. Promethean (older) – The older Promethean boards are white with a small circle in the top left for calibrating. This is usually lit white when on and working. Promethean (newer) – The newer Promethean boards have a dark grey surround with in built speakers. It still has the circle/light in the top left corner of the board. 1. Board not responding: it seems simple, but make sure all conectors are plugged in correctly – especially the board’s USB cable. If this doesn’t work, you can check to see if your computer recognizes a Promethean board by plugging it in and then opening the ‘ActivManager Control Panel’. Left click the triangle in the bottom right of the screen and select the ‘active manager’ icon (may look slightly different on your computer). Then select ‘Control Panel’ from the menu. If no devices are present in this list, then your computer isn’t recognizing the board you plugged in. 2. Board not responding (but plugged in correctly): often this problem can be solved by changing the USB port you are plugged into on your computer. 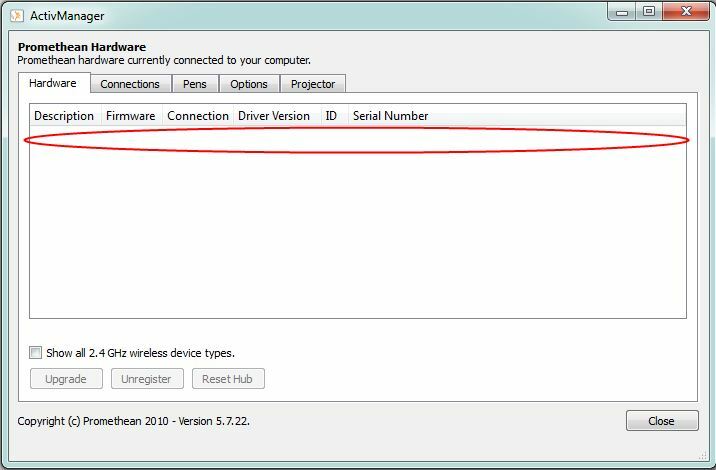 For example, if you have a docking station you are plugged into, try plugging the USB connector directly into one of the laptop USB ports. 3. Board not responding (plugged in correctly, tried different USB ports): sometimes with the Promethean boards, the driver doesn’t install correctly when plugging in the computer. Something worth trying is a manual install of the Promethean IWB driver. The latest version of this can be installed easily from the applications window on your desktop – simply double click the ‘ActivDriver 5.7’ icon (found under the staff sub category). 4. Your computer won’t recognize one of the new Promethean boards: the newer Promethean model has a power button located on the left side of the board, behind the speaker. If this button is lit red, it is currently off, to turn it on, touch the button and it should turn green (greeny yellow – see bellow). 5.The board projection is washed out one particular colour: This is usually caused by the monitor output cable not being fully plugged in. Check both ends of your monitor cable and make sure it is pushed in all the way.